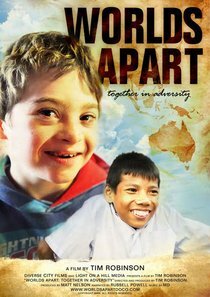 Customer Reviews For "Worlds Apart: Together in Adversity"
This dvd does an awesome job of raising awareness about disability issues both in Australia and in a third world setting. Taking a back seat view of life, the dvd shows access to support, community and school services, family support, hopes and dreams of the children and their families. It shows how much disability affects not just one person but their whole family and community - and their whole life - not just one section of it. This documentary also shared how important faith was to the families abilities to continue to live and support each other. WORLDS APART: Together in Adversity is a feature documentary that follows the lives of two children living with disability. It explores the unique daily challenges faced by two families from very different parts of the world. Joshua is nine and has many disabilities, which affect his everyday life. His Mum and full time carer is Toni. Recently, she was presented with an Australian Citizen of the year award for her advocacy of disability care and awareness. Suphot lives in a remote jungle region of Thailand. At seventeen, he is enjoying his first year at high school. In a village with little education about disability, his positive attitude and sparkling personality is a great witness to the community. Share in the laughter, tears, joy and pain as we take a ‘fly on the wall’ look into the lives of these incredible people.